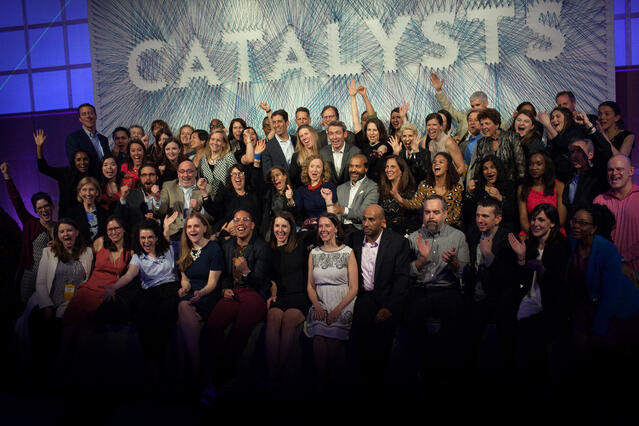 We are grateful for the amazing community of social impact leaders who have partnered with us to make our 20th year one filled with high-impact collaborations, thought-provoking convenings and conversations, and deepened work to support a diverse portfolio of breakthrough social entrepreneurs. As we look back on 2018, we want to share with our community ten highlights from our year at New Profit that would not have been possible without all of you. Reimagine Learning made one-year, $100,000 grants in six breakthrough organizations who together will make meaningful gains for the 1 in 5 students with learning and attention issues across the U.S. The six organizations that received grants—CAST, Eye to Eye, LiftEd, National Center for Learning Disabilities, National Center for Special Education in Charter Schools, and YouthBuildUSA—each create and advance solutions to better meet the needs of millions of students who are not being served well by traditional learning approaches and school models. New Profit supported the first group of eight social entrepreneurs in Unlocked Futures, an initiative designed to catalyze the growth and impact of organizations started by entrepreneurs who have been directly impacted by the criminal justice system launched in partnership with John Legend's FREEAMERICA and Bank of America. 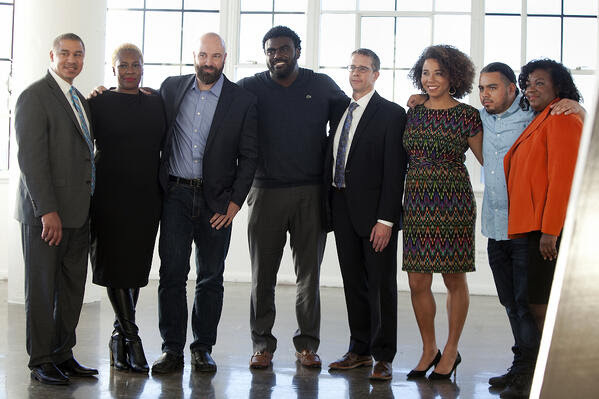 The eight entrepreneurs are: Will Avila of Clean Decisions, Amanda Alexander of Detroit Justice Center, Marcus Bullock of Flikshop, Topeka K. Sam of Ladies of Hope Ministries, Teresa Hodge of Mission: Launch, Jason Cleaveland of Obodo, Dirk Van Velzen of Prison Scholars Fund, and James Monteiro of Reentry Campus Program. New Profit’s Proximity Accelerator has made one-year unrestricted grants of $50,000 to eight new breakthrough organizations led by visionary social entrepreneurs of color: Reyna Montoya of Aliento, Ashley Edwards of MindRight, Allen Woods of MORTAR, Mary Moran of Our Voice Nuestra Voz, Maya Martin of PAVE, Yannell Selman of P.S. 305, Christine Ortiz of Station1 and Sixto Cancel of Think of Us. In 2018, we welcomed three new leaders to the New Profit team. In February, Aaron Lieberman, co-founder of both Acelero Learning and Jumpstart, joined our team to lead the Early Childhood Support Organizations (ECSO) Initiative, a public-private partnership focused on early learning. In September, we welcomed John Kania, a preeminent nonprofit and corporate consultant and author of highly-regarded books and articles on social change, as an Executive in Residence. Kania is bringing his expertise in systems change to help build our practice supporting and growing systems entrepreneurs. Soon after, we welcomed Dr. Venkat Srinivasan to our Board of Directors. A Managing Director at Innospark Ventures, Dr. Srinivasan is a leading technology investor and a serial entrepreneur who has founded multiple mission-driven enterprises that leverage technology to improve education and health outcomes for vulnerable populations. 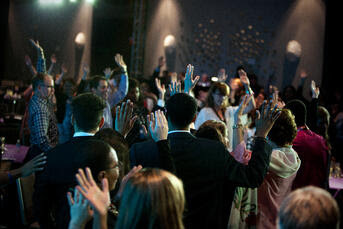 At the 2008 Gathering of Leaders, David Gergen—former White House advisory to four presidents—posed a powerful challenge to New Profit's community. He argued that despite the level of dynamism, innovation, and evidence-building in social entrepreneurs' work, our community was overlooking an outsized lever to effect social change: policy. From that clarion call to align, advocate, and act, America Forward—New Profit's bipartisan policy initiative—was born. Read about America Forward's work over the past ten years engaging a coalition of 70+ social entrepreneur-led organizations who collectively advocate for policies that reward results, incentivize innovation, advance equity, and catalyze cross-sector partnerships in Transforming Local Impact into National Change: A Path to Move All of America Forward. After having leveraged $1.7 billion in public funding for social innovation over the past ten years, America Forward celebrated another major win earlier this year with the passing of the Bipartisan Budget Act of 2018, which included key Pay for Success and evidence-based provisions such as reauthorization of the Maternal, Infant and Early Childhood Home Visiting program, The Family First Prevention Services Act, and the Social Impact Partnerships to Pay for Results Act. In December, we convened 170 leaders in the education space including young people, parents, educators, school districts, nonprofit leaders, and other education practitioners to discuss how to implement an integrated approach to whole child development in their work, bridge silos and build connections, and develop concrete action steps both individually and collectively. 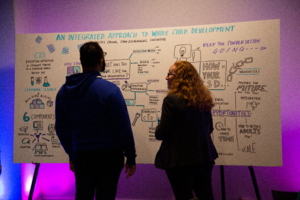 Read the 2018 Education Convening highlights here. Capitalizing Diverse Leaders and Organizations: How can we close resource gaps and drive greater impact and partnership with leaders from underrepresented communities? Advancing System Entrepreneurship: How can we support entrepreneurs who are tackling the conditions that hold social problems in place? The Future and Our Work: How can the social impact sector adapt to disruptive trends—from automation to AI—that are transforming the economy and the future of work? Sam Silvers, Principal and U.S. markets and relationships leader of Deloitte Consulting LLP who oversees corporate citizenship, the Deloitte Foundation, and Monitor Institute by Deloitte, announced a 3-year renewal and expansion of Deloitte's multimillion-dollar collaboration with New Profit. Deloitte and New Profit have collaborated since 2013 to build the capacity of 34 high-impact organizations and initiatives that collectively reach millions of people across America. Read the breakthrough story on New Profit and Deloitte's social impact collaboration here, and listen to testimonials from some of the social entrepreneurs we have served over the past five years talk about the power of receiving Fortune-500 caliber strategic support here. In September, we launched #UnlikelyDuos, a video series that brought together pairs of philanthropists and social entrepreneurs from New Profit's community for candid conversations about the future of social problem-solving. These "unlikely duos" were given thought-provoking questions to respond to and discuss on the spot, and we were able to see where a conversation can go when it's centered on getting to know another person and his or her perspective, rather than the technical aspects of change-making. Watch the video series and read accompanying articles delving deeper into each duos' background and work on Giving Compass. 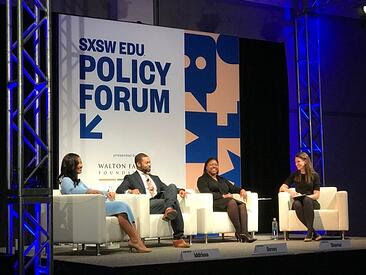 In March, New Profit grantees, staff, and community members attended SXSW EDU, a premier education conference, to spearhead dialogue about key trends shaping the future of education. From trauma-informed education policy to personalized learning and community-engaged strategic planning for school districts, our community led discussions that shared actionable insights and lessons learned from our work on the ground to drive change in K-12 education. Looking forward to 2019, we will be hosting another panel at SXSW EDU titled CEO State of Play in Personalized Learning. The panel will bring together leaders from our Personalized Learning initiative to share their insights on the nascent field and answer key questions on what it is it like to be a CEO in the fast-paced and evolving world of personalized learning. This month, we released our 20th Anniversary Annual Report: What Makes Us... Ready. Different. Community. Breakthrough. This year's annual report looks back at the impact of our work over the past two decades backing visionary leaders, strengthening our sector, and driving widespread change. The venture philanthropy model we have built and dynamic community of social impact leaders we have engaged have made this work possible, and we are now ready to break through on the next era of social problem-solving in partnership with a new generation of grantee-partners. As we look ahead, we asked 20 leaders from our community to reflect on our shared future. Explore the second half of the report to read their big, audacious goals for the future and their calls to action for our community to help us make progress towards achieving them. As 2018 comes to a close, we are excited to look back and share media pieces written by and about New Profit from this past year in Forbes, The Chronicle of Philanthropy, Stanford Social Innovation Review, VICE Motherboard, Inside Philanthropy, CNBC, NationSwell, and more. Check them out here. We look forward to keeping the momentum going in 2019 and beyond!